The Picts were ancient people from northern and eastern Scotland. They are first mentioned in written records in AD 297, before the Roman conquest of Britain. The name 'pict' is from the Latin pictus meaning 'painted.' This may have been due to the tattoos on their bodies. It may also refer to a name they called themselves, that was recorded by the Romans. They spoke a Pictish language. It was related to the Brythonic languages spoken by the Britons living to the south. Picts were possibly the descendants of the Caledonians and other tribes that were mentioned by Roman historians. 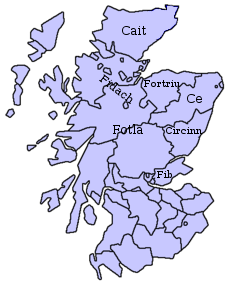 The area of Scotland called Pictland gradually merged with the Gaelic kingdom of Dál Riata. This formed the kingdom of Alba, later known as Scotland. Alba then expanded, absorbing the British kingdom of Strathclyde and Bernician Lothian. By the 11th century the Pictish identity had become a part of the Scottish people. This page was last changed on 22 April 2015, at 18:26.